I don’t think it’s an accident that Americans are kept in the dark about ESC. Despite the fact that Eurovision launched the careers of ABBA and Celine Dion, despite the fact that the event is bigger than twenty Super Bowls among EU spectators, Americans, by and large, have never even heard of it. I believe this is by design. Anyone traveling in Europe in the last few decades knows that American pop music is stinking up the airwaves everywhere from Cyprus to Slovenia, and it’s safe to assume that European music lovers would prefer to hold their annual song contest with a minimum of Britneys and Justins dominating the proceedings as they do on EU radio. So, sixty years ago, they found the best way to keep Americans disinterested in their fabulous music pageant: they put “Euro” in the title. Because there’s some sort of filter in the American popular consciousness that keeps all foreign matters from entering their star-spangled brainpans. The winning country then becomes the host for the Eurovision event the following year, generating the same sort of local gridlock, terrorist activity and mafia kickbacks seen in cities which host the Olympics. This year’s ESC was held in Vienna, and was partially hosted by last year’s winner, Conchita Wurst, a drag queen songstress with a lilting voice and good taste in ball gowns. You feel the promise of a fabulous night as the show opens with a bearded lady being flown in on wires while the Vienna Boys Choir harmonizes with her. I’m really going to miss Conchita. But despite the strong opening, the rest of the event this year was pretty dull. It only served to instruct the viewer on the formula for a typical Eurovision song entry. Most are ballads, sung by sparkling females, which kick into disco choruses with the aid of sparks and flames shooting from the stage. The songs have titles like “Live Tonight Again” or “Tomorrow Never Forgets Yesterday,” they feature what I like to call the “vocal pitch hiccup” (the singer suddenly shifting to a high pitch, often in the middle of a word – pop hook gold! ), and invariably include a sweeping key change. The singers are dressed like Narnia Queens, or if dancing, like Shakira. Sometimes the ballad is a duet with a guy with a shaved chest, black vest and gold tennis shoes (yes, these shoes are a fashion trend, apparently). They usually sing in phonetic English, which is disappointing to me. I’d prefer to hear vocal pitch hiccup in the mother tongue. There’s a tradition of female singers crying at the end of their song, with even more tears flowing while the scores are being tallied at the end. These are “soccer tears,” displays of emotion intended to influence the jury. When Conchita Wurst won last year, she/he accepted victory with a dramatic, weeping humility worthy of a dozen Miss America winners. As I’ve always said, it takes a drag queen to show women how to work it like a real diva. This year, the winner was obvious: a male solo act who will forever be known as “Sweden.” He interacted onstage with some interesting real-time animation, and his song was instantly radio-friendly (it had three composers – one for the the key change, presumably). But here the momentum of the show breaks down as the voting takes at least another hour. Granted, the parade of glamorous TV personalities from around the globe, who announce their country’s rankings, is almost as spectacular as the twenty-seven musical acts, but there are only so many tears of gratitude from well-coiffed pop singers I can take. I suppose this country’s taste for talent competitions is satisfied by American Idol and its ilk, but unlike those shows, the Eurovision Song Contest isn’t about washed-up pop stars crushing the dreams of the undiscovered. It’s about breakthrough talent destroying the hopes of entire nations. I think this has the potential to change the fate of our species. 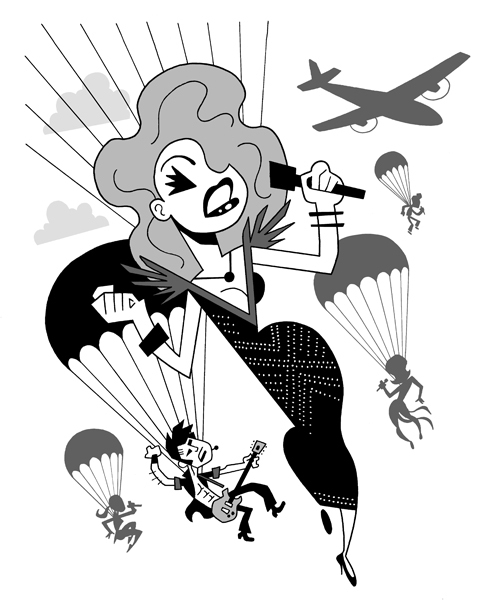 Imagine a world in which global conflicts revolved around fabulous show tunes instead of nukes and drones. Imagine world leaders debating off-key singing and performers' hairstyles instead of apartheid and holy wars. Imagine a history in which Hitler could only invade Poland by rewriting Mein Kampf as a stirring torch song he must perform in designer jeans and gold tennis shoes. And imagine he gets beaten by a bearded drag queen and has retreat to the bunker to write a new song for next year. And to practice his crying.